Now that I have figured out how to apply a context to our data using JSON-LD's syntax, we need to publish our data to be able to query against it in our web app. There are many options to publishing our data, and Dr. Bansal recommended Fuseki. To try it out, I installed Fuseki on my local machine. As you can see, you can provide your query a prefix. This allows you to reference keys in your data without having to provide the entire URI; it just makes the queries more readable. The ?name is known as a SPARQL variable. SPARQL variables start with a ? and can match any node (resource or literal) in the dataset. Inside of the where clause is where you can see is where I can ask for all StadiumsOrArenas and names that are linked with the schema:name predicate. This is called a Triple Pattern. Triple Patterns are just like triples, except that any of the parts of a triple can be replaced with a variable. This is very powerful, because it allows us to discover unknown relationships. I need to continue testing and running queries against our dataset to ensure I have properly defined our Schema that produces useful queries. This part of the project is very exciting, because this is actually what will set our application apart from any other real-estate application. I was unable to complete any significant research this week. The time I did spend was researching JSON-LD's documentation on their site ​http://json-ld.org/. The examples they use in the documentation use a single instance of an object and is easy to understand,but my issue is we have to apply a context to multiple instances of pre-existing data. If I were to apply the concepts explained in the documentation, I will need to manually apply a context to every instance, which seems unrealistic. I will continue researching this issue through other resources. The goal for this week was to convert our current JSON data to JSON-LD. I had watched some videos earlier in the semester that covered JSON-LD, and I had thought the process of converting JSON to JSON-LD would be quick and simple. I began researching JSON-LD's documentation to better understand how JSON-LD works. I found a really helpful resource that covers JSON-LD's syntax. After looking through this syntax, I realized this task would not be as simple as I thought. However, there is an aliasing feature that can allow me to map keywords in my current JSON documents to JSON-LD context keywords. I will need to test a subset of the data we have gathered to ensure I am able to successfully produce valid JSON-LD from pre-existing JSON data. I was not able to work on the conversions this week, because I spent a majority of my time building our Rails app. I had developed a Rails website for personal use, and I had already chose a cloud hosting service named Heroku for my personal site. Since I had the background knowledge of setting up a Rails app on Heroku, I chose to setup our Real Estate app the same way. I chose to Heroku's cloud hosting service, because it really makes managing and deploying apps easy (also, because they offer a free plan). I was able to build the skeleton for our web-app and deploy it via Heroku. Once the app was live, I began working on how we would manage our site. I connected the Github repo that houses our app to Heroku, and then setup automatic deployment. Anytime someone pushes to our master branch, the changes will automatically get deployed. Deploying this way is really useful for team oriented projects, because there is one central location for our source code. Heroku has it's own standalone client to manage your repo, but this can cause issues if Github and Heroku become out of sync. Also, I was able to setup Travis CI (Continuous Integration tool) to run tests before any changes to the code gets deployed. Since this is a Ruby on Rails app, it cannot be viewed locally in a browser like a standard html site. The only way to get a visual of any code changes was to deploy the changes. This is generally not good practice, because it's a live site. We need a way to test and view our local changes before deploying. To get around this issue, I was able to setup a development environment that allows you to run the rails server command that allows you to view the site the "localhost". I would like to add more Travis CI tests to run against any pushes to our master branch, but I am not familiar with the different tests for Ruby on Rails apps. This is not a priority, so I will look into this during my downtime. This week was very productive. I spent hours researching why my Redfin scraper appeared to be skipping statements causing it to crash. I finally learned that the reason this was happening was because when a selenium web driver interacts with a webpage is such a way that causes the page to load/reload, we have to also write a script that will stop the script from executing the next statement until the page has completed loading; Selenium does not know to wait for a page to load, so if the page does not load quick enough, the next statement will be executed to soon, and this is exactly what was happening to me. Thanks to Harry J.W. Percival, the author of Test-Driven Development with Python, he covers how to resolve this issue on his blog. I then took what I needed from that post and incorporated it into my script. To test the new wait method, I added a condition to only scrape Arizona properties. After a few hours, the script completed without any errors. I then felt confident enough to allow the script to scrape the remaining states. This process took 5 days to complete (slowness is the downside of using Selenium, because it requires an actual browser to make the calls). Because the script goes to every city and downloads a unique csv file to a designated folder, I ended up with a folder with almost 9,000 csv files. The next step is to convert all of the data to JSON format, so I needed a way to combine all of the files into one. I did not want to do this manually, so I look into way to automate this process. After researching Pythons libraries and found a way to search for all csv files in a given directory and write each file into a new one. This worked out pretty well and I now have all of the property data I scraped from every state in one file. I have yet to convert the data to JSON. While the script was running, I took the time to organize all of my scrapers and data, then push them to our Github repository for this project. My Goals for this week was to get my Redfin scraper to work. I was finally able to find a way to automate the download with Selenium. I found that the reason I was unable to download was due to the additional prompt browsers display that give the option to either save, or open the file. Selenium has a method that allows you to set the webdriver to ignore the prompt and download in a given location. Once I applied the changes, I tested it by loading a site that had the download link: https://www.redfin.com/city/18607/AZ/Tempe. I then used selenium to search for and click the download link, and it worked. My next step was to make it automate the download for every city in the US. The reason I had to search by city was due to the input validation done on Redfin's website. The search box will not function unless provided an accepted format - City, State being the largest area that can be searched. Search by only It was actually quite difficult to get a list of every city in the US that was free. Zip codes are accepted, but there are a lot more zip codes then there are cities; therefore, the time it would take to complete the script would increase. When I did find a free resource, they were generally incomplete, or organized in a non-intuitive way. I eventually found what I needed, and was able to reformat it to be used as input for my script. I thought I had it figured out, but then I ran into a lot of issues when trying to automate the download for every city. First, there were a few checks I needed to include in the script to handle the faults on Redfin's site. One fault that would occur is when a city and state is provided that is not recognized by Redfin, it would display a pop-up window with suggestions for other cities. To handle this, I had to add a check to verify the current url did not change; if the url did not change, then I know the fault had occurred. If the fault occurred, I would reload the site, then search the next city. Another fault that I noticed was that it would sometimes load the page for a given city, but the city would not have any listings nor download link. To handle this fault, I included a try catch block to catch the NoSuchElementException that is thrown when the download link is not present. As you can see, the site loaded for Tempe (see url), but after the download it did not go back to the main redfin.com, instead it searched Tolleson in the search box above. This would not be an issue if the site was able to recognize every city, but due to the fault explained earlier, if Tolleson was not in their list of valid cities, it would crash my script. I could not figure out why this would occur. My assumption would be that it was due to the inconsistent loading times, so I began researching the different wait methods. I first decided to bring in Python's time library to use the sleep function. This will force my script to stop for a given amount of time, then continue. It did seem to improve the script by completing a few more cities before crashing, but it would eventually crash. I knew that approach was risky, because the time for a page to load is inconsistent. I then found Selenium's explicit wait method that waits for a certain condition to occur before proceeding further in the code. At the beginning of the week, I met with Julie to discuss and provide feedback on the interface she has been designing for our web app. We were able to agree on the color scheme, brainstormed ways to make the site more user friendly, and realized additional pages that will need to be added. My priority for this week was to get back to scraping data from our other sources. I wanted to get the smaller sets completed first, so I began researching sources that held all stadiums in the US. There were a couple of sources to choose from, but Wikipedia had the simplest structure for web scraping. They have a page that list every stadium, including: capacity, city, state, year opened, type, and tenant. Because the data needed was within one table, I was able to use Microsoft Excels PowerQuery plugin. It was really simple to use. All I needed to do was provide the url to the site that contained the table, and then the application would automatically parse the data and let you choose which section of the page you would like to scrape. Since I decided to keep everything in json format, I wrote a script to parse the csv file and convert it to json. Since the source did not provide the address for the stadiums, I was interested in finding out whether or not Google's Geocoder will be able to handle requests when provided the name of the stadium. According to their documentation, it states that an address must be entered. I went ahead and tested it with one stadium name and I actually received a successful response with the accurate location data. Since that worked, I made a few adjustments to my script to include the requests library so I can make the API calls and obtain the responses. However, this did not provide location data for every stadium. There are some that list an empty list with the status of "ZERO_RESULTS". I will revisit the list to see how may stadiums are missing location data to see if it won't be too time consuming to enter the data manually. I started researching the different real estate site that are out and many of them do not allow web scraping of their data, and their APIs are very restrictive, but they do allow 1000 calls per day. Trulia has an API, but they only return statistics in cities, counties, states, etc. I will continue to research other real-estate application and hope that I find more open data. If I do not, I can sign-up for a Trulia account and start making the 1000 calls per day. This week, I continued work on trying to solve the issue reading the data I received from Great Schools in the desired format. 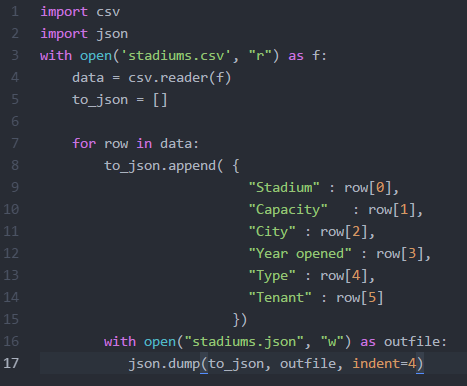 After studying and testing the csv and python libraries I was finally able to figure out how to pull only the address in the format I needed. I tested this by using a sample data set of school information (for more time efficient testing). By getting it to the tuple format, I was able to print/access the full address, because python was able to differentiate the delimiter from the string elements. Since I was able to successfully obtain the address from the great schools data, I was able to look into writing the script to make use of Google's Geocoder API. This was a fairly simple task, because Google's geocoder html requests are straight forward. I needed to concurrently read in all of the addresses from the great schools data, make the html geocode request using python's requests library, then appending the found data to respective school's data in my Great Schools data-set. As I was writing the script, I was thinking about how our triple store will be implemented/created later in the project. I thought it would be nice to start working on tagging our data (make it machine readable) now, vs. having to tackle the issue later. Earlier in my research, I learned about JSON. There are tools like JSON-LD that would make our job of creating our triple store much easier. Since what I currently have is just the data, and not the corresponding identifier for each piece of data, I looked into how to convert it to JSON's key value pair format. After some time of researching how this can be done, I was able to accomplish this task by constructing a dictionary as I was parsing the csv file. Once I finalized writing the csv content to a dictionary format, I was able to use the json.dump() method to create the json encoded file. Google provides a geocoding API that takes in an address and outputs the corresponding latitude and longitude. However, there are usage limits to using server-side geocoding with a quota of 2,500 requests per IP per day. Google also has a limit for client-side geocoding, but is not a restrictive. It may block requests if all of the users are making requests at the same time. Since our application will have a limited dataset and is still in development, we can incrementally obtain the latitudes and longitudes for all of our address each day. When our application is actually deployed, we can use client-side scripts from Google's API to place markers on the map. I spent some time reading and going through the tutorials on their API site to ensure I fully understood how to use the tools that are available. I really wanted to become familiar with their Maps API, because I envision us using this for the application we develop so we can place markers for our found places and use their methods to determine which places are nearby to a selected real-estate property. While going through the tutorials, I found a way to use Google's API to return nearby places to a given address, and allows you to choose the type of places to be shown. This was a really cool find, because maybe we can use that to obtain general places for our map, for example: Libraries, restaurants, etc. I decided that this may be something I can revisit in the future if we have time, since we have already realized our datasets, and I am not sure how if it is possible to use their APIs to make that many requests. Once I was comfortable enough to begin testing their API against our Great Schools data, I started researching how to obtain only the address from the csv file containing all of our school data. Whenever I would try to return the address I would only receive the address up to the first comma; the City, State and Zip was not returned. The reason this was happening was because I needed to use a comma as a delimiter, because each element was separated by a comma. Somehow, the reader was reading each line as a string, which is why the reader read each line as having five elements vs. three. I guess somewhere in the process of gathering and storing the data from Great Schools cause an issue with the csv generated document. I did not want to go back and re-write/test the great schools script I had written, because it takes almost 4 hours for the script to complete. Instead, I needed to find a way to write a script that would properly interpret what I have. I was unable to solve this issue yet, and will continue to research python libraries to help me resolve this issue. I will also look into seeing if it would be best to keep everything in json format, since that format will better align with storing our linked database (triple store) we will be creating.